Stir the sugar, cocoa powder and coffee in a medium bowl until the cocoa powder is dissolved. Stir in the cheese. Fold in the whipped topping. Cover and refrigerate for 30 minutes. 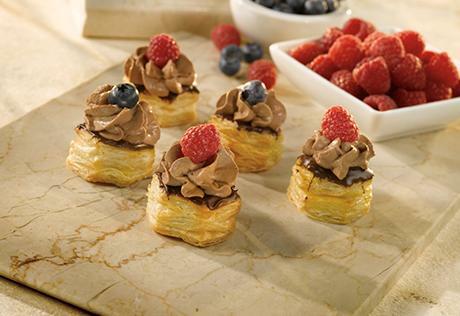 Dip the tops of the pastry cups in the melted chocolate and place onto a baking sheet. Let stand until the chocolate is set. Spoon or pipe the cocoa mixture into the chocolate-dipped pastry cups. Top each with 1 raspberry.